This charming cottage has undergone recent renovations and now provides excellent accommodation. It is situated in formal grounds with pine trees, clipped beech, box and yew hedges. The spacious cottage has an entrance hall, a laundry room with washing machine, dryer, w.c. and basin. There is a well equipped kitchen which has a delightful aspect over the colourful garden. The kitchen is fully equipped with an electric oven and hob, microwave, fridge and freezer, dishwasher, toaster, electric kettle and food processor. The kitchen leads to the dining room, which is furnished with antiques. The long oak refectory table can sit 10/12 comfortably, and is ideal for leisurely dinner parties and convivial evenings. The sitting room, overlooking the garden has comfortable sofas and chairs, a fitted carpet with rug, and a large log fire. Curl up on the sofa to watch your favourite film, or browse the internet with free wifi access. The room also has a hi-fi system. The tv has sky freeview channels. The master bedroom furnished with lovely antiques, has a romantic brass bed and looks out onto the garden and pine-woods. The en suite bathroom has an overhead shower over the bath. All remaining bedrooms are spacious and freshly decorated with fitted carpets, and rugs; all have zip and link beds, which can be made up into king size beds or left as single beds. All beds have duvets and synthetic pillows. Antique furniture, original paintings, books and magazines add to the feeling of this being a home away from home. A local produce hamper, with provisions for a full English breakfast for the duration of your stay is available for £25. The house is available as of 4 pm on the Friday. We kindly ask guests to vacate by 10 am on the morning of departure. Coachhouse is ideal for larger groups and may be rented with pretty Glasfryn Uchaf, which is adjacent. The Coach House is a charming character cottage which lies within mature gardens. Ideal for larger groups with comfotable accommodation. 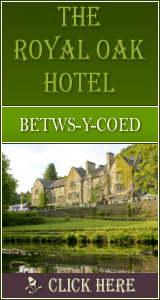 > Bed linen and logs free of charge-towels extra £5 per person. 1231 Click Throughs => �615.5 Since 13/May/2013 based on an example �0.50 cost of a click through from Google pay per click.